Every time Charlotte Tilbury releases a new product its music to my ears. Her eyeshadow quads are by far the best I own, her shadow sticks I use daily and you can always find one of her rose gold bullet lipsticks floating around in my handbag. So when I heard there was a new foundation release - a higher coverage 'magic' foundation that was 5 years in the making no less - you can imagine how eager I was to try it out. 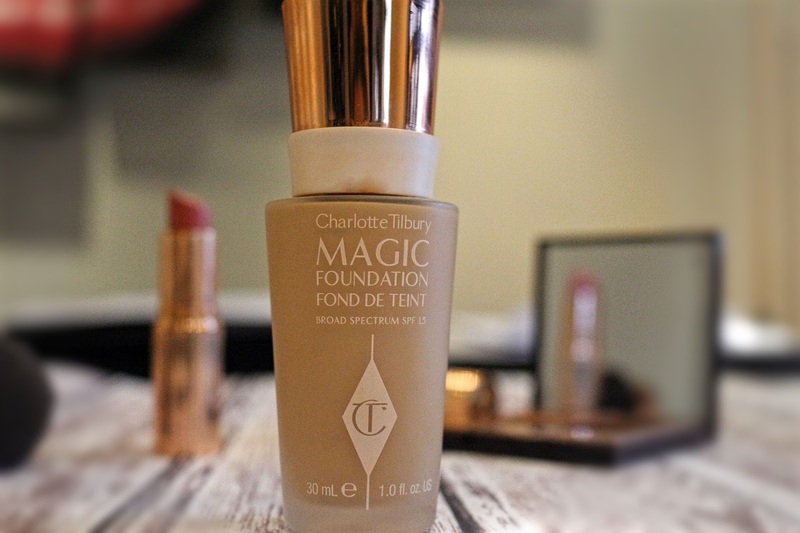 I have used her first formulation, the light wonder foundation, previously and I always found it to be a really beautiful finish but it was far too low on the coverage side for my liking. I found it to be more akin to a tinted moisturiser and I would usually find myself mixing it with a higher coverage foundation to get the look I wanted to achieve. So when the magic foundation was released, with high coverage claims - I thought my prayers had been answered. I headed down to Selfridges, and had one of the insanely pretty artists apply it to my face. In store, wether it was the perfect lighting or make up artists skill I'm not so sure, but I loved the look of my skin and I quickly scooped up a bottle. Once i tried the product home it was a different story. Firstly the shades are not in line with those in the Light Wonder foundation range. In the former, I found a perfect yellow toned shade that blended seamlessly with my skin. In the Magic formulation, I was stuck right between two shades, one being too light and too pink toned for my skin, and one being a little too tan. I chose the lighter one, number 6, hoping to be able to warm it up with bronzer if I needed to. In my mind, this product was going to deliver a similar feel and coverage to the Armani Luminous Silk, a firm favourite of mine (perhaps even my holy grail). In reality, it just did nothing for my skin. I would actually describe it as a medium coverage, although it layers well and so coverage can be built up that way. It wasn't really glowy, nor was it matte. My skin felt a little bit one dimensional and flat, and I had to rely on a lot of highlighter and bronzer to brighten it up and add some complexity to the face. It smelt a little bit weird/chemically as it dried down. It didn't last very well, and within 4-5 hours it had slipped a little and I had a few dry patches. I wouldn't necessarily call this a 'bad' foundation. Its probably a good all rounder as far as foundations go. Its just not 'Magic'. There is nothing really magical about it, and I struggle to understand how it took 5 years to be made... what the hell were they doing?! its just nothing new. If put in a blind test, I would probably say that its an adequate foundation, and if it was a drug store brand id be more inclined to recommend it - at around a £10-15 price mark. But its not - its £29.50 and it doesn't live up to the rest of the brand, unfortunately. So this one is a miss for me, and I won't be repurchasing. Its back to the Armani LS for me! Do you have any foundation reccomendations? Let me know in the comments... I love putting them to the test!